Thyme scientifically known as Thymus vulgaris is an upright, woody-based perennial which is primarily grown as a culinary herb in herb gardens. 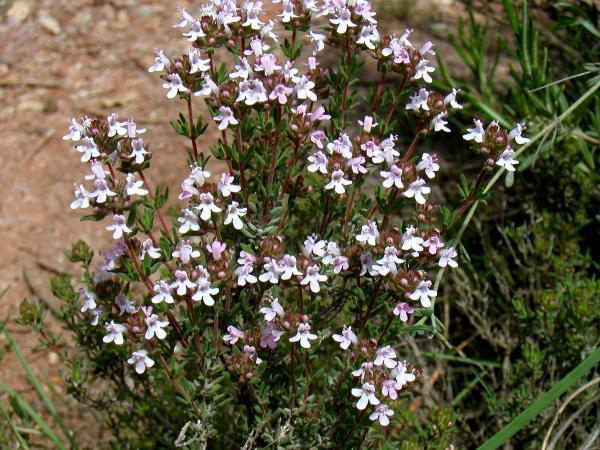 The herb is commonly known as common thyme, German thyme, garden thyme, thyme, winter thyme, German winter, narrow-leafed French, Greek gray, broad leaf English and mother of thyme. It is a species of flowering plant in the mint family Lamiaceae and belongs to the genus Thymus which is part of the mint family and closely related to oregano—another powerful herb. The herb is native to the western Mediterranean region from the Iberian Peninsula to Italy (northern Italy, southern France (including Corsica), eastern Spain and the Balearic Islands). 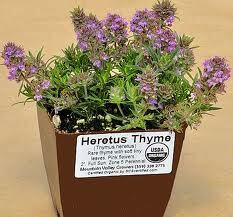 The origin of the word thyme perhaps goes back to either the Greek word, “thumus” which means “courage”, or from the Greek word “thymos” meaning “to perfume”. 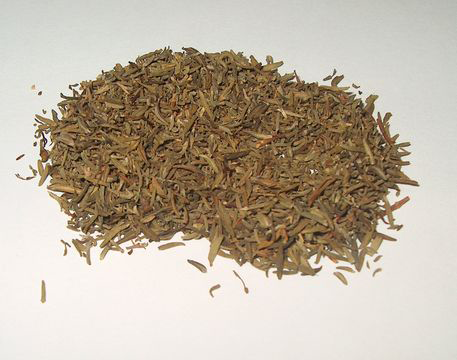 It is an aromatic perennial evergreen herb with culinary, medicinal, and ornamental uses. 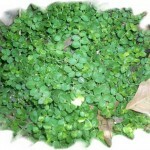 It is useful in the garden as groundcover, where it can be short-lived, but is easily propagated from cuttings. 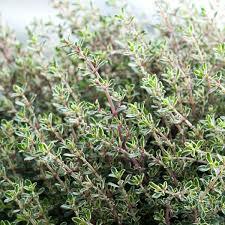 It is also the main source of thyme as an ingredient in cooking and as an herbal medicine. Thyme is an aromatic, bushy, woody-based perennial, evergreen herb that grows about 15–30 cm (6–12 in) tall by 40 cm (16 in) wide. It is found growing in dry slopes, rocks, dry walls, stony banks, rough grassland and wasteland, and woodlands in Mediterranean regions. It prefers light, permeable soil somewhat rich in organic matter and mineral fertilizing elements. It also does best in loose, sandy or rocky soils with excellent drainage. The plant has woody, fibrous root and numerous reddish-brown, round, hard, branched stems that are usually from 4 to 8 inches high, when of the largest growth scarcely attaining a foot in height. Stems are covered with tiny, linear to elliptic, pointed, gray-green leaves which are distinctively revolute (leaf margins are rolled under). Leaves are small, only about 1/8 inch long and 1/16 inch broad, narrow and elliptical, greenish-grey in color. They are arranged in opposite pairs on the stem. 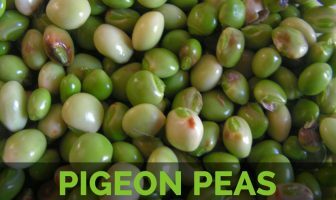 They are highly aromatic (reaching their peak just before plants flower) and are frequently used fresh or dried as a seasoning in a variety of culinary applications including soups, stews, sauces, meat and fish dishes. Whorls of tiny, tubular, lilac flowers appear on the stem ends in late spring to early summer. White, yellow or purple flowers are arranged in dense clusters at the end of the branches. Calyx is tubular, striated, closed at the mouth with small hairs and divided into two lips, the uppermost cut into three teeth and the lower into two. The corolla consists of a tube about the length of the calyx, spreading at the top into two lips of a pale purple color, the upper lip erect or turned back and notched at the end, the under lip longer and divided into three segments. Flowering normally takes place from Jun to August. Fruits are actually tiny seeds that are minute and found abundantly. Flowers are attractive to bees. Thyme is excellent at supporting the immune and respiratory systems as well as the digestive, nervous and other body systems. It’s a serious powerhouse when it comes to staying healthy. Check out some of the top ways this herb can help improve your health. Thyme is an excellent source of iron, providing nearly 20 % of the daily recommended allowance of this mineral. Iron is essential for the development of the red blood cells and energy production. Deficiency of iron may cause anemia, exhaustion and increased susceptibility to infection. 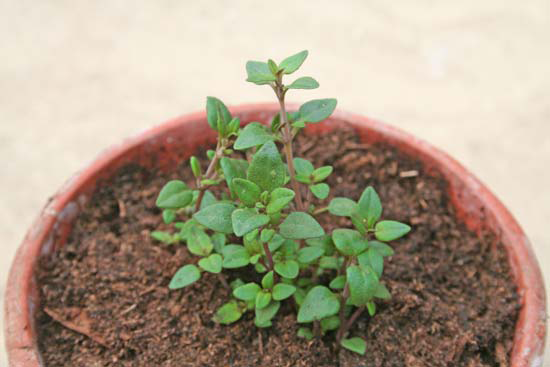 Including thyme in your diet helps in the prevention and treatment of anemia and other blood disorders. Thyme is quite beneficial for protecting you from food poisoning and infections caused by food-borne pathogens. It is a great food preservative for products like meat, as it fights bacteria such as Salmonella typhimurium, Staphylococcus aureus, and Vibrio parahaemolyticus that cause food poisoning. The antibacterial ability of thyme is more effective than that of cinnamon, bay, and clove in preventing food-borne pathogens such as Salmonella enteritidis, Escherichia coli, Campylobacter jejuni, Staphylococcus aureus, and Listeria monocytogenes. And thyme essential oil leaks through the skin and effectively kills parasites that can cause various diseases in a way that the condition does not relapse. Thyme is one of the essential oils used in aromatherapy. By working on neurotransmitters, it affects the activity of neurons and might thus improve your mood. This might lessen nervous conditions like depression, insomnia, and nightmares. Thyme is an excellent source of Vitamin K and a great source of iron, calcium and manganese. These minerals play an important role in bone health, promoting proper bone growth and development, and reducing the risk of bone disorders. Thyme helps in sustaining powerful, healthy bones and preventing bone diseases. Delivery of nutrients to the hair follicles is vital for hair growth. Thyme improves blood circulation to the scalp. Rubbing an oil mixture with thyme in it or thyme essential oil benefits in easing the delivery of nutrients to the scalp and encourages hair growth besides making it healthier and shinier. Antibacterial properties of thyme make it one of the popular remedies for bad breath as it helps fight bacteria and infection in your mouth. Increase in bacteria in the mouth is responsible for causing bad breath. 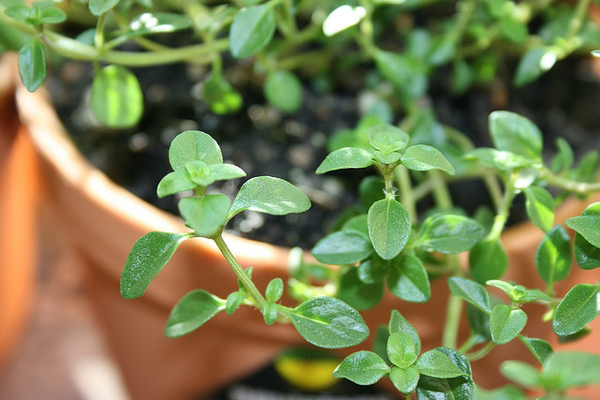 Thyme is also used as an ingredient in antiseptic mouthwashes meant to cure cavities and gingivitis. Thyme is very effective against Shigella sonnei. This is actually a bacterium that can cause diarrhea. Wash lettuce in 1% thyme oil or thymol to reduce the number of Shigella bacteria. Thyme essential oils are also used as natural food preservatives. Thymol, a compound found in thyme, is an ingredient in many different pesticides. It’s been shown to efficiently repel mosquitos, which can help prevent mosquito-borne disease. 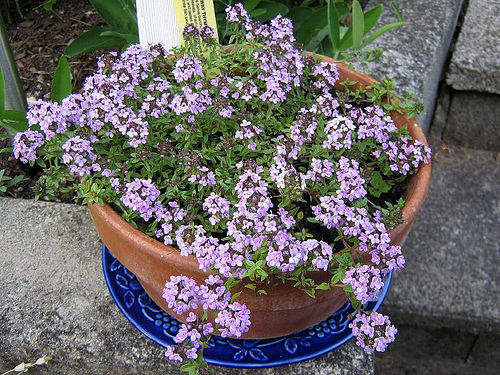 Common thyme has a very long history of folk use for a wide range of ailments. Thyme is appreciated for its antiseptic and antioxidant properties, it is an excellent tonic and is used in treating respiratory diseases and a variety of other ailments. Flowering tops are anthelmintic, strongly antiseptic, antispasmodic, carminative, deodorant, diaphoretic, disinfectant, expectorant, sedative and tonic. 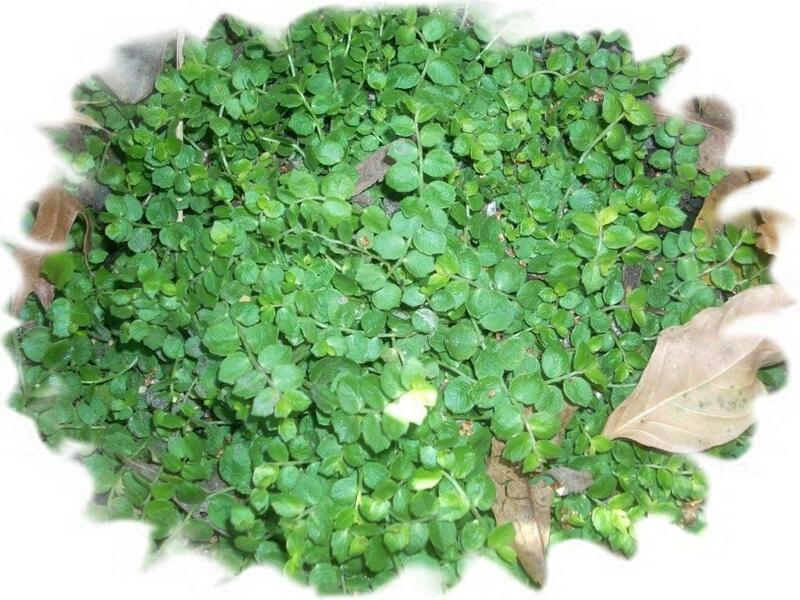 Plant is used internally in the treatment of dry coughs, whooping cough, bronchitis, bronchial catarrh, asthma, laryngitis, indigestion, gastritis and diarrhea and enuresis in children. Externally, it is used in the treatment of tonsillitis, gum diseases, rheumatism, arthritis and fungal infections. Thyme has an antioxidant effect; therefore regular use of this herb improves the health and longevity of individual body cells and thus prolongs the life of the body. The essential oil is strongly antiseptic. Whole herb is used in the treatment of digestive disorders, sore throats, fevers etc. It is used especially in cases of exhaustion, depression, upper respiratory tract infections, skin and scalp complaints etc. It will ‘cure sciatica and pains in the head,’ and is healing in leprosy and the falling sickness. It is effective for snakebites, poison of marine creatures and headaches. Tea made from thyme’s leaves prevents nightmares. It helps in functionality of the lungs and treats the disorders associated with lungs. Thyme alleviates chronic gastritis, lack of appetite, enteritis, Dyspepsia, indigestion, irritable bowel and colic. It eases convulsion, stomach cramps, menstrual cramps and spasm induced cough. It encourages and tones up nervous system such as neurasthenia, depression, nightmares, nervous exhaustion, insomnia and melancholy. It is good for tumors, dental decay, plague, thrush, tonsillitis, halitosis and deep wounds. It destroys hookworms, roundworms and threadworms. The Romans used thyme in the treatment of depression. Cancer: Take one tbsp of thyme with one tbsp of honey. Have 3-4 times a day. Cold, flu: Boil the herb in a cup of water. Add some honey for taste and drink warm. It reduces fever. 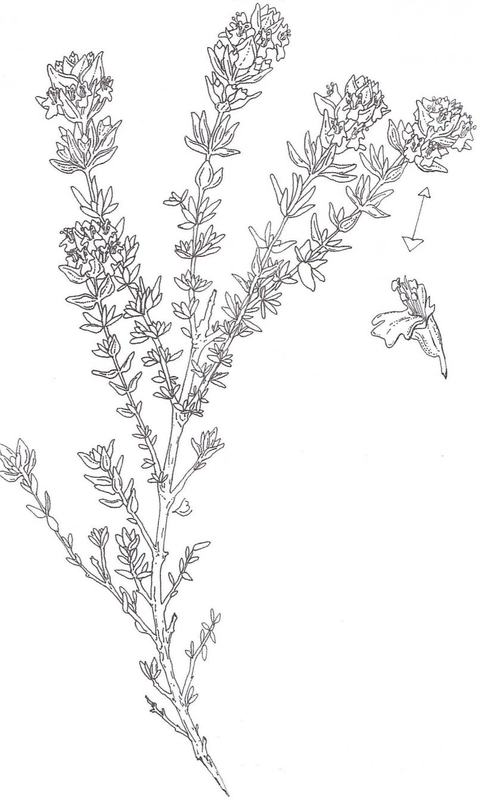 Altitude Sickness: Prepare a decoction of Thyme seeds. Have a cup once a day. Cuts: Prepare a tea from thyme. Use it for wash cuts twice or thrice a day. 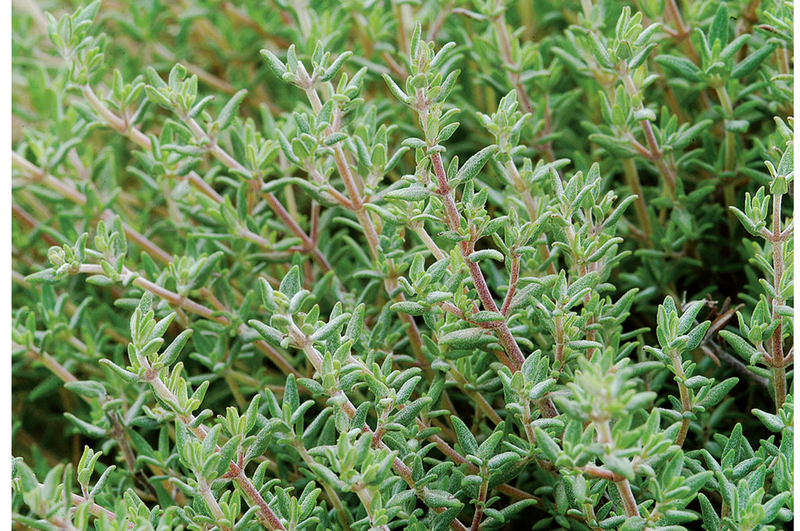 Whooping Cough: Prepare a tea from thyme. Drink 3-4 times a day. Neuralgia: Take cotton cloth. Fill with dried Thyme. Place it over affected part for half an hour. 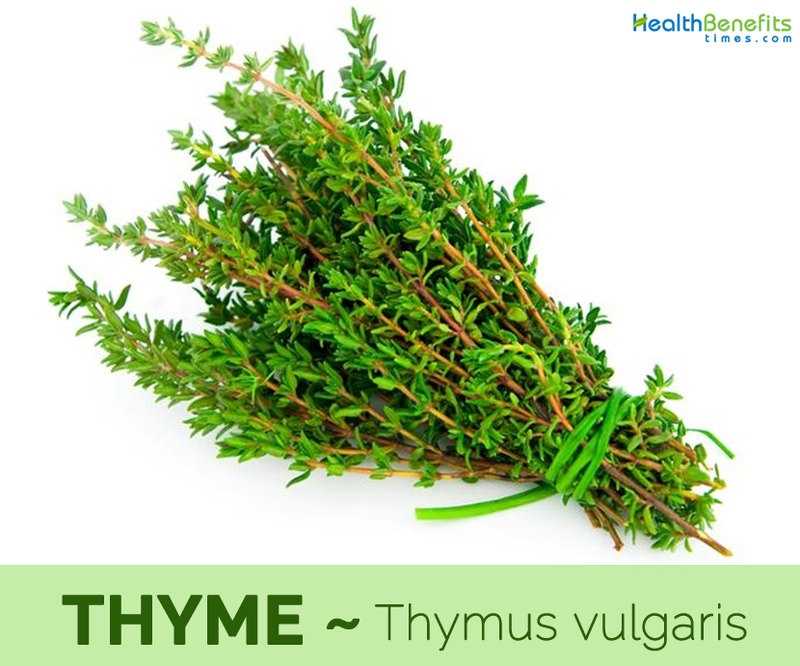 Lung Diseases: Take a handful of fresh leaves of thyme. Boil it in water. Cool it. Strain and drink tea twice a day. OR Inhaling the steam helps in giving relief from nasal congestion and lungs congestion. Debility: Boil fresh leaves of thyme in a cup of water for 10 minutes. Strain it off. Drink this decoction once a day to keep your health good. Alcoholism: Prepare a thyme tea by boiling the fresh leaves of thyme in a cup of water. Strain off this decoction after 10 minutes. Set it cool. Give one tsp of this decoction to the alcoholic person after every 15 minutes to get best results. Depression: Put the fresh leaves of thyme into a tub containing warm water. Take a bath for 15 minutes in this water. It provides relief and gives rest to your body. Digestive disorders: Prepare a tea with thyme leaves by boiling them in a cup of water for 5 to 10 minutes. Strain it off. Drink this warm decoction after a heavy meal, It keep your digestive system healthy and well maintained. Osteoporosis: Boil fresh leaves of thymes in 100 ml of water for 10 minutes. Strain it off. Drink this warm decoction once daily. It keeps your bone healthy and safe from the diseases. Bad breathe: Gargle with thyme tea daily to remove bad odor from the mouth. Botot’s spot: Prepare a tea with thyme leaves by boiling them in a cup of water for 15 minutes. Strain and drink twice daily. Bronchitis: Boil a cup of water and add 1 tsp of dried thyme. Stir it well for 10 minutes. Remove it from the heat and allow it to cool. Add honey to taste and drink. Repeat this process to get relief from bronchitis. Leigh’s disease: Pre an infusion by boiling 1 tsp of dried thyme leaves in one cup of hot water for 15 minutes. Drink it twice daily. Mouth Cancer: Have a cup of thyme tea every day. OR Take some dried thyme leaves and add it to meals, salads and soups. Asthma: Take Lobelia, Thyme and Ephedra. Prepare a decoction. Drink 2-3 times a day. Whooping Cough: Prepare a decoction of wild cherry, Sundew, Coughwort and Thyme. Take two times a day. Candidiasis: Prepare Thyme and Fenugreek tea. Drink it 3-4 cups a day. OR Let it cool. Wash the infection with this tea. Bad Breathe: Add 6 drops each of Thyme, Tea tree oil, Chamomile, Peppermint in brandy. Use it as a mouthwash. Emphysema: Add basil, Hyssop and thyme oil in one jug of boiled water. Take steam bath. Respiratory Diseases: Take some boiling water in a bowl. Put 8-10 drops of essential oil of sage and thyme in it. Cover your head and face with a towel and inhale the aroma. Anxiety: Take sage dried and powdered, basil leaves dried and powdered, Rosemary dried and powdered, Thyme powdered, and Ginger dried and powdered in equal amounts. Mix all ingredients. Have half tsp with milk at night daily. Baldness: Take 20 gm. olive oil, 20 gm. almond oil, 20 gm. Jojoba oil, 10 gm. Tea Tree oil, 10 gm. Thyme oil, 10 gm. Patchouli oil, 20 gm. Rosemary oil and 20 gm. Spikenard oil. Put all oils in a glass bottle. Leave it for a week. After a week massage your scalp with this preparation twice a week. It is an effective formula to cure hair problems. 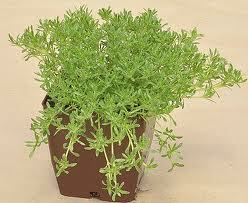 Asthma: Boil a cup of water in a pot with an equal amount of 1 to 2 tsp of Thyme and Plantago. Put the half tsp of lemon juice and 1 tsp of sugar in it. Boil them for 10 minutes. Strain off this mixture. Drink this mixtures four times a day to treat Asthma. Pneumonia: Boil 1 tsp of Plantago and Thyme in 100 ml of water. Add 1 half tsp of sugar and Lemon juice in this water. Boil it till it reduces to half. Strain it off. Drink a cup of this warm decoction sip by sip in every hour to get cured. In Ancient Egypt, thyme was used for embalming. The Ancient Greeks used it as incense in temples, and they added it to bathwater. 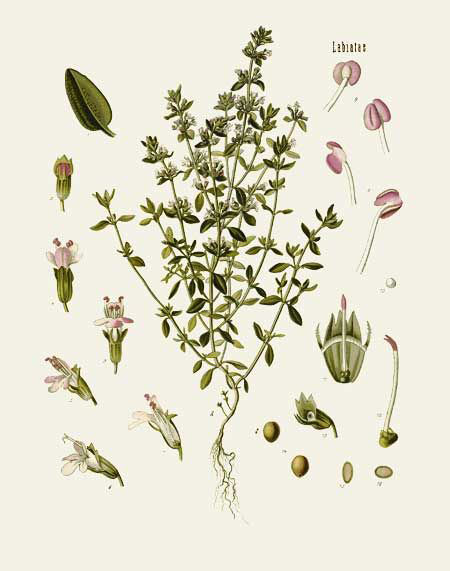 The Romans used thyme as a flavoring for cheese and alcoholic beverages. They are also said to have offered it as a cure people for who were melancholic or shy. They are believed to have introduced it to the British Isles. Hippocrates, who lived around 460BC to 370BC, and who is known today as “the father of Western medicine,” suggested thyme for respiratory diseases and conditions. It was grown in gardens and gathered in the countryside. When the Black Death swept across Europe in the 1340s, posies of thyme were worn for protection. 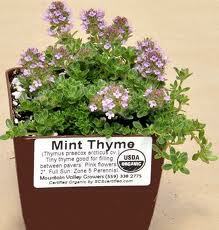 Scientific research does not support this use, but thyme has been shown to have a range of medicinal properties. Apart from their warm pungent, acrid taste, Thyme a good source of nutrients, vitamins and minerals. Consuming 0.8 gram of Thyme offers 0.14 mg of Iron, 1.3 mg of Vitamin C, 0.014 mg of Manganese, 0.004 mg of Copper, 0.004 mg of Vitamin B2, 3 mg of Calcium,2 µg of Vitamin A,0.1 g of Total dietary Fiber, 1 mg of Magnesium and 0.003 mg of Vitamin B6. Moreover many Amino acids like 0.001 g of Tryptophan, 0.001 g of Threonine, 0.002 g of Isoleucine, 0.002 g of Leucine, 0.001 g of Lysine and 0.002 g of Valine are also found in 0.8 gram of Thyme. Elfin Thyme is tiny, closely spaced flowers and leaves cause it to be not just one of the tiniest thymes but in addition one of several slowest developing thymes. 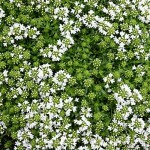 Elfin Thyme is an excellent option for growing in between stepping stones exactly where spaces could be very little. It is usually contained in our well-known Flagstone Filler Assortment. 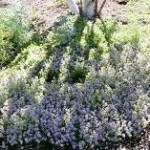 A aromatic mounding thyme, Lime Thyme is really an excellent ground cover. The brilliant green lime-colored leaves are scented of citrus as well as assist brighten darker edges of the garden. 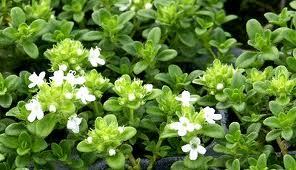 It flowers during the summer time which can be after most thyme. Although fragrance is incredible, this particular herb is much more decorative as compared to culinary and doesn’t have got a citrus flavor and doesn’t make a sufficient cookery herb. 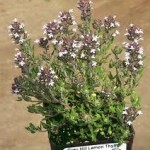 To cook, make use of Lemon Thyme, a tall prolific grower stuffed with citrus taste. 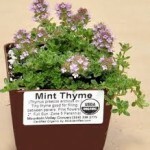 Mint Thyme is probably the four thymes we frequently suggest for planting in between flagstones. These were grown in June and therefore are rapidly developing to fill out the space between your stones. Soon after growing, these were mulched seriously along with tiny ground bark to control weeds as well as preserve dampness. 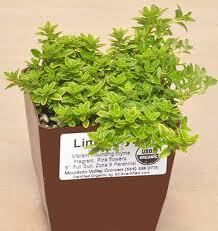 Watering well the very first month or so is essential to getting thymes to establish them rapidly. Thymes have got rather short root systems therefore watering well throughout hot summertime is essential to keep a pleasant even green cover. When we love the way mint thyme looks, it doesn’t have got a fragrance and also have no clue why it absolutely was given this title. Soft as well as silvery, Woolly Thyme is within a category by itself. Closely knitted, it can make excellent filler for in between pavers or even alongside borders. It hardly ever flowers that makes it great for those hypersensitive to bees. It grows gradually and may die in patches if watering is not even. It will be the grayest of all the thymes and should not be mistaken with the productive bloomer and greener Hall’s Woolly Thyme. 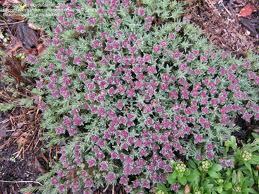 We now have had several successes along with developing Woolly Thyme in partial shade in the hot summer environments. Drainage needs to be outstanding. 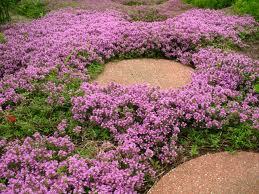 Hall’s Woolly Thyme is actually a rapid developing, fairly flat ground cover. It is just a excessive spring bloomer. 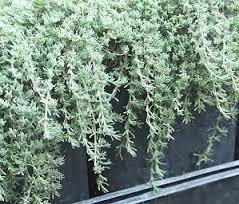 Not to be mistaken with Woolly Thyme that is extremely silver as well as slow developing. Hall’s Woolly Thyme remains woolly yet is green having a silvery cast. It is just a excellent filler in between as well as beneath taller plants. This particular floriferous mass is all about two feet in diameter less than one full year soon after growing only two three inch pots. Coconut Thyme doesn’t smell or even taste just like coconut, however it sure flowers well as well as grows rapidly. It really is nice planted near Caraway Thyme simply because both of them are heavy bloomers yet bloom at distinct occasions. Coconut blooms within July. One of several heavier blossoms within the creeping thyme group, Coconut Thyme develops rapidly and is also engrossed in the flower heads for around 4 weeks in summer time. Lemon Frost Thyme truly lives as much as its title. An instant grower along with fantastic lemon scent, it really is ideal for covering huge sections of ground. Lemon Frost is probably the round-leaved Thymes. These are the oil glands which release the marvelous lemon fragrance of the Thyme. Other lemon scented ground cover thymes have the variegated types Doone Valley Thyme, and Gold stream Thyme, and also the dark green Pink Lemonade Thyme. These 3 bloom pink. If you prefer ground cover thyme that actually works to fill out fast, then select Caraway Thyme (shown above creeping throughout a plug tray). 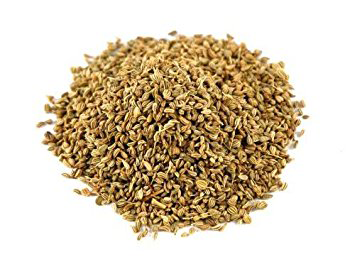 Scented just like a Caraway seed, Caraway is probably the few thyme ground covers which have an aroma. It’s got deep green leaves which are go about a half inch aside along reddish stems. Caraway Thyme is a nice rampant grower and really should be utilized exactly where space just isn’t a problem. 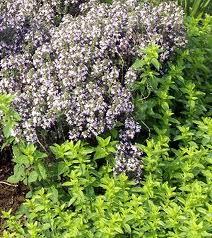 It blooms mid spring and is also nice whenever planted using a later blooming thyme just like Coconut Thyme. Caraway Thyme can be used as an alternative to real Caraway in almost any recipe. It really is particularly nice in bread or even cooked with meat. The species title herba-barona converts herb of beef and describes medieval times when herbs were commonly used to spice up meat which had gone only a wee bit past its expiration date. 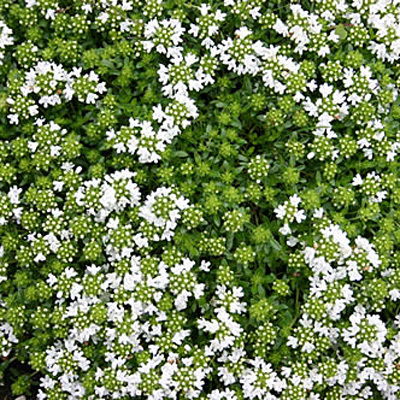 The thyme together with the humorous title, Loveyanus Thyme does not get lots of consideration in books as well as magazines, however it is an attractive ground cover thyme along with golf ball size flower heads as well as soft big (for a thyme) silvery green pointed leaves. It features a flowing habit which magnificently fills up the empty spaces within the garden. The Pink Gaura above (the reddish stems reaching upward) have been completely encompassed by Loveyanus Thyme since the thyme looks for more ground to spread out onto. Since it blooms during the early spring, it can make an especially nice under planting for Roses. 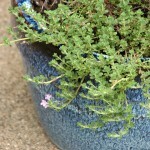 A fragile looking creeper, Pink Chintz Thyme has got little fuzzy gray green leaves set near together around the stem. This will make it well suited for smaller sized spaces just like those in between stepping stones or even flagstones. 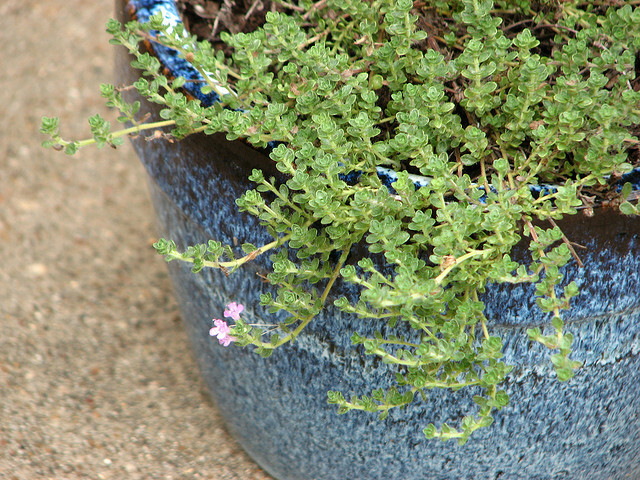 Pink Chintz Thyme is just one of four small-leaved thymes that people suggest for tight spaces. Others are Mint Thyme, White Moss Thyme and Elfin Thyme. White Moss Thyme certainly illuminates the area it is in. Its white flowers are about 2 ” tall and show off just like little spikes all around the plant. It may be sheared right after blooming or even left alone. If left alone, the dead flower spikes will ultimately disappear. It absolutely was grown between flagstones which are placed about 8 inches apart. 3 months later. It had already achieved 6 inches in diameter. 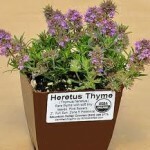 Heretus Thyme is just one of our most uncommon ground cover thymes having its lengthy, narrow, gray-green leaves that provide it a nearly delicate look. Yet, don’t allow its look fool you. This really is one tough plant and is also worthy of any kind of garden. The Heretus Thyme on the left peeking from under a Tricolor Sage measures about six inches in diameter and was grown only 3 months just before in June. At maturation it can reach Ten to twelve inches across. 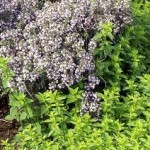 Much more remarkable compared to way Heretus Thyme grows and covers the ground is actually the amazing show of lilac flowers it creates during the early spring. Beneath Heretus Thyme bud gets ready to burst forth using its beautiful color. 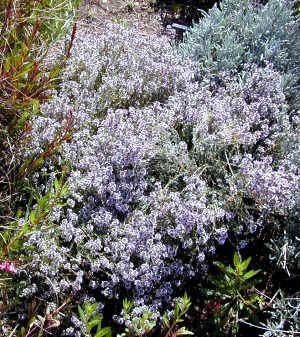 Lavender Thyme is probably the most uncommon ground cover thymes. It’s got needle like leaves along with a rich aroma much like Lavender. It flows effectively down the sides of pots that make it great for hanging basket mixes. 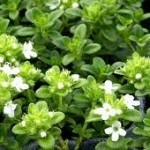 It is easy to realize why at once this particular plant was known as Celery Thyme. The colorful green foliage is offset through the countless of dainty pink flowers. Perhaps (since the close up on the left shows) probably the most uncommon of all of the ground cover thymes, Silver Needle Thyme is really somewhat soft to walk on. It appears beautiful cascading on the short wall or even edging. 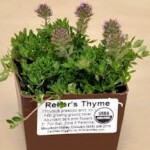 Reiter’s Thyme is really quick growing thyme that we have difficulty that contains it in a tiny pot. 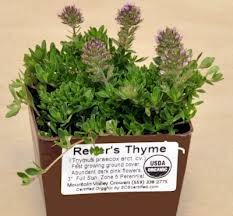 Once Reiter’s Thyme will get set up it can make an attractive display of flowers early in the year. The flowers fall off after a while and also the thyme proceeds its creeping way. 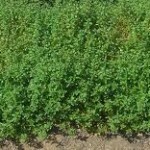 The long spaces or even stem sections in between these leaves are what help Reiter’s Thyme to be one of the most intense creeping thymes. The longer the space in between leaves the faster the thyme covers the floor. Given damp ground to creep on, these types of stems sets roots in the soil, successfully creating a brand new plant. 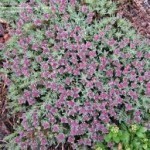 Creeping Pink Thyme has got extremely green nearly tasty leaves. Too big for in between steeping stones, but simply ideal for filling below tall plants or even roses. This particular long stemmed beauty grows rapidly and remains fairly flat. Green all through most of summer as well as fall, Doone Valley Thyme gets into its variegated stage within the cool of spring. Seriously perfumed of lemon, Doone Valley Thyme constitutes a great little mat or even mound for filling out as well as around taller plants just like Grape Sage or Lemon Verbena. Every plant propagates to around 18 inches as well as creates 3 or 4 inch long flower heads filled with pink flowers. If the flat ground cover is preferred, these types of flowers ought to be sheared off after bloom. If they’re left, the thyme will creep over the spent flowers, including height on the mound. Pink Lemonade Thyme is really a Mountain Valley Growers’ introduction. 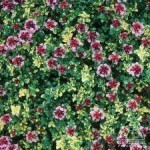 It really is distinctive because it’s non-variegated lemon perfumed ground cover thyme along with excessive pink flowers. The majority of lemon scented types either have got white flowers just like Lemon Frost Thyme or even bloom hardly any. 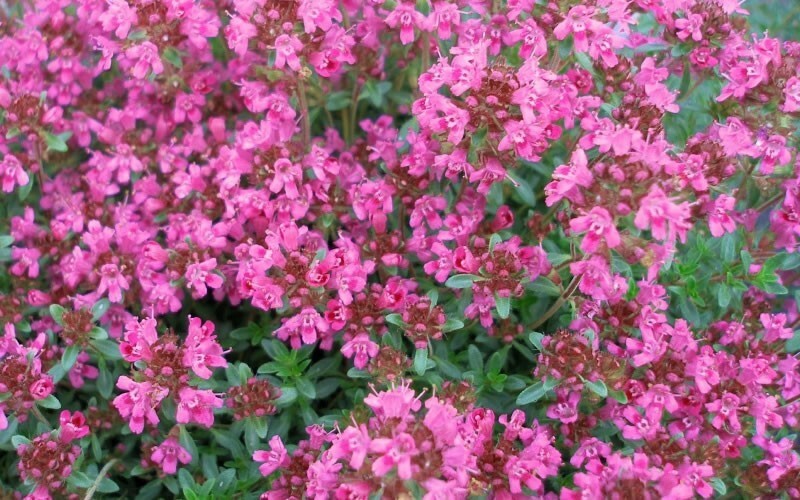 Pink Lemonade Thyme has got dark green, tightly spaced leaves and is also sufficiently small to utilize in between flagstone and yet fast developing enough to cover bigger spaces. 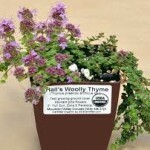 It is usually great mainly because it blooms later on in summer after a number of other thymes have completely finished. We’re also having luck with it growing well in partial shade since the picture above shows. The bloom turns into a little taller within the shade yet as soon as the thyme completes blooming the plant remains near to the ground. This particular thyme doesn’t have a lemon taste sufficiently strong for usage in the kitchen area. 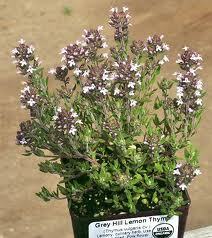 To cook, utilize Lemon Thyme, a tall productive grower, filled with citrus taste. 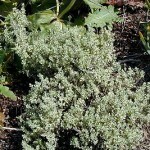 Silver Thyme as well as Hi Ho Silver Thyme is scrumptious inclusions in any kind of cooking herb garden. 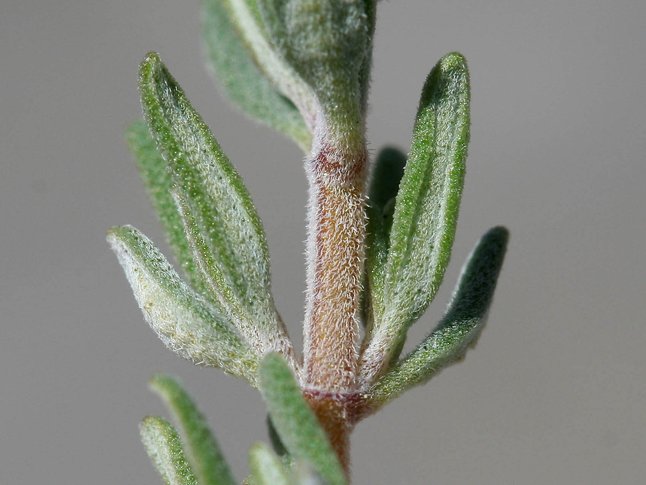 Silver Thyme is edged with only the barest line of white while Hi Ho Silver Thyme (pictured at top and also to the left above) exhibits abnormal white variegation through the entire leaves. Both may be used in almost any recipe calling for Thyme. 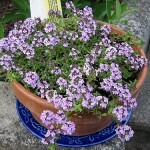 Pennsylvania Dutch Tea Thyme has got big oval, dark green, aromatic leaves which are usual for the species pulegioides. These types of leaves create a powerful flavored tea which combines well along with other herbs. It might be utilized fresh or even dried. Try replacing it for English Thyme in cooking. Cooking Thymes help to make incredibly aromatic inclusions in any kind of patio or even sunny windowsill. Our 20 inch oval planters are ideal for developing Thyme or any other small herbs. Orange Balsam Thyme is really a difference of Thymus vulgaris, or even English Thyme. 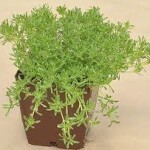 It features an incredibly stinky scent as well as taste and could be utilized in any kind of recipe calling for Thyme. Orange Balsam Thyme needs to be trimmed back by about a third after bloom. This really is simplest if the thyme stems are collected by the fistful, snipping many at once. 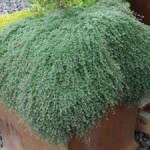 Juniper Thyme is really a stinky little sub shrub which develops about 6 inches tall as well as blooms abundantly. 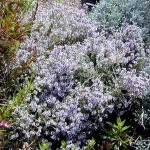 It silvery firm needles additionally provide it the title Moonlight Thyme. Cut flowers off after bloom to help keep it tidy. 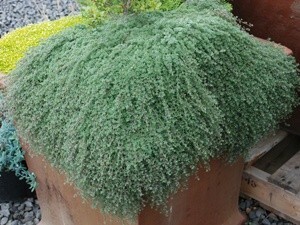 Culinary Thymes, just like Juniper Thyme, are little which will make them ideal candidates for growing in the container. Our oblong windowsill planters are ideal for keeping an aromatic pot of Thyme in the backyard or even windowsill. 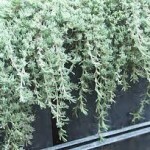 Silver Thyme as well as Hi Ho Silver Thyme is scrumptious inclusions in any kind of culinary herb garden. 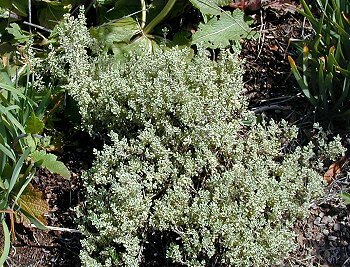 Silver Thyme is surrounded with only the barest line of white while Hi Ho Silver Thyme exhibits abnormal white variegation through the leaves. Both may be used in almost any recipe calling for Thyme. Italian Oregano Thyme blooms at the beginning of spring just like the new growth from Marshall’s Memory Oregano is emerging. 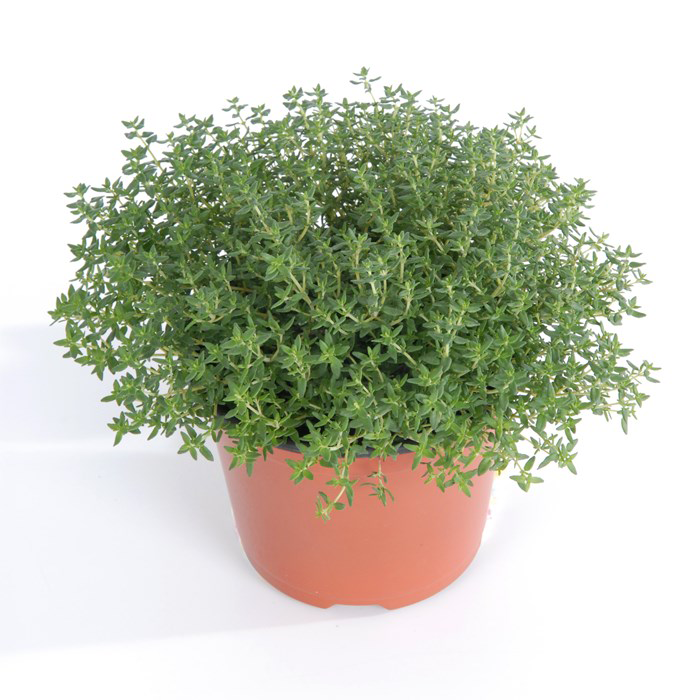 The thyme is approximately 12 inches tall. It will bloom for around 4 weeks just before shutting down. Once out of bloom, it’s important to trim it back 6-8 inches to inspire fresh useful growth. This can additionally allow it to be tidier looking compared to if it is left alone to the own devices. Lemon Thyme appears like English Thyme as well as grows just like English Thyme but that’s where the likeness stops. Lemon Thyme certainly has the aroma of lemon as well as tastes just like lemon. You can use it in almost any recipe calling for lemon juice, lemon zest or even lemon flavoring. It develops just like a weed so there is definitely more lemon standing in the garden. Lemon Thyme included with marinade is excellent along with fish or even chicken. 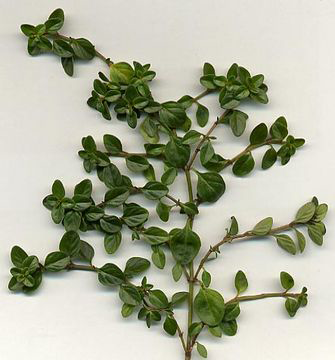 Lemon Thyme’s shiny green foliage could be sheared to create one of many knots in the traditional knot garden. Grey Hill Lemon Thyme is really a chance seeding possibly from Thymus vulgaris, or even English Thyme, as well as Thymus citriodorus or Lemon Thyme. It features a incredibly stinky aroma and also flavor and could be utilized in any recipe calling for Thyme or even Lemon Thyme. Grey Hill is really a smaller sized form of both of its parents. It really is preferably suitable for smaller gardens or even containers. After it blooms at the beginning of spring, it ought to be trimmed carefully to eliminate spent blooms. Grey Hill is a crucial earlier blooming plant for bees, butterflies as well as beneficial insects. Leaves and flowering tops are used raw in salads, used as a garnish or added as a flavoring to cooked foods, going especially well with mushrooms and courgettes. The leaves can be used either fresh or dried. An aromatic tea is made from the fresh or dried leaves. 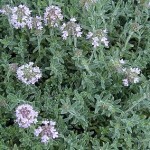 Thyme has been used in the preparation of season soups, and sauces. The herb is one of the ingredients in bouquet garni along with bay leaf, parsley, and celery. 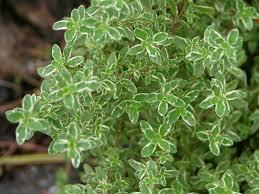 Thyme, along with other spicy items, has been used to marinate and stuffing to chicken, fish and meat recipes. 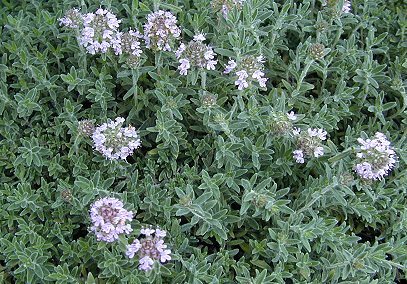 Fresh or dried leaves of thyme as well as the flowering tops are widely used to flavor soups, stews, baked or sautéed vegetables, casseroles, and custards. 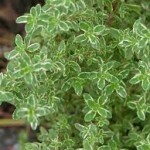 Thyme is also used in marinades, and in stuffing. It can also be used to flavor jellies, bread, vinegar, marinades, sauces and in bouquet garni. The herb is easily and readily available both fresh and dried year-round. Fresh thyme is more flavorful, but it’s also less convenient. If you buy it fresh, it can last a week or two in the refrigerator. Dried thyme should be stored in a cool, dark place and ideally used within six months. Dried version can be replaced for the fresh kind in most recipes. One teaspoon of dried leaves is equal to one tablespoon of chopped fresh thyme. This herb can be consumed in a variety of ways. The most common is as a fresh or dried herb in any culinary creation. For medicinal purposes, it can be bought in the form of a tea, tincture, supplement or essential oil. Thyme is available in fresh, dried and powdered forms in the herb store all-round the year. It is always suggested to buy fresh thyme whenever possible since it contains more nutrients and flavor. Thyme essential oil is one of the most important oils used in aromatherapy. An essential oil from the leaves is frequently used in perfumery, soaps, toothpastes, mouthwashes, medicinally etc. It has fungicidal properties and is also used to prevent mildew. Leaves are dried and used in pot-pourri. Plant makes an attractive ground cover for a sunny position. Dried flowers are used to repel moths from clothing whilst the growing plant is said to repel cabbage root fly. Thyme baths have been used to help relieve aches and joint pains. Scent of burned thyme was used as freshener of temples. Bravest knights were wearing scarves embroidered with thyme as a symbol of courage during the medieval times. 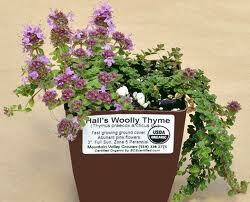 Thyme was part of funeral rituals in the past. Coffin filled with thyme was a guarantee for safe and successful passage to the next life. Hymettus honey is special type of honey made from the pollen and nectar collected from thymes that grow on the Mount Hymettus in Greece. Young women wore a bouquet of blossoming thyme to signal their availability for romance. Avoid if inflammatory disease of the gastrointestinal tract. Overdose may cause gastric irritation, headache, dizziness, convulsion and coma. People with heart problem, seizure disorders or epilepsy should avoid this. Avoid use by high blood pressure patients. It may cause stomach disorders. Avoid in case of allergic problems. Caution if sensitive to grasses. Dilute oil in carrier oil before topical use. Avoid using thyme 2 weeks before a surgery. The oil can cause allergic reactions and irritation to the skin and mucous membranes. Native Southern Europe from the western Mediterranean to southern Italy. Soil Light, permeable soil somewhat rich in organic matter and mineral fertilizing elements. Flower White, yellow or purple flowers, arranged in dense clusters at the end of the branches. 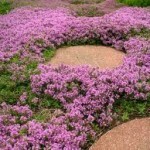 Thymus vulgaris var. capitatus Willk. 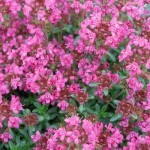 Thymus vulgaris var. verticillatus Willk. Calories 1 K cal. Calories from Fat 0.09 K cal. Calories 12 K cal. Calories from Fat 2.88 K cal.